In this Thursday, July 19, 2018, file photo, guide Pedro Cinta descends down a line to the Neptune Memorial Reef where he will lead Will Payne to watch the installation of a memorial plaque for for Payne's parents, Buel and Linda Payne, near Miami Beach, Fla.
A year after Will and Daniel Payne lost their mom, and nearly two decades since their father's death, it was time to follow their wishes for the afterlife. As they board a boat with three generations of family, the brothers slip into flippers and de-fog their masks. Will, who became a certified scuba diver just days earlier, checks his oxygen tank and jumps into the azure waters to secure a concrete marker mixed with their ashes at a memorial reef about three miles out to sea. This unusual resting place is exactly what the Paynes say their parents wanted. Buel Payne, a former Coast Guard member, and Linda Payne, who grew up on the water and loved boating, will spend their afterlife in a memorial modeled after the lost city of Atlantis, among impressive lion statues and ornate gates and pillars that encrusted with sea life. It took nearly four years for multiple government agencies to sign off on this underwater mausoleum, which is designed to encourage a healthy ecosystem. Roughly a decade later, the Neptune Memorial Reef is home to the cremated remains of 1,500 people, and any snorkeler or scuba diver can visit. The Paynes are the first to be memorialized in the reef's expansion, which opened this summer and will make room for an additional 4,000 memorials over 16 acres, about 40 feet deep. Placements start around $1,500 and can go up to $8,000, with the priciest placements for specialized shapes like sea turtles and stingrays or for prominent spots throughout the city like the lions. With reefs struggling worldwide against coral bleaching and other threats, the memorial's builders are providing coral a head start. The concrete structures offer a high pH level, enabling sea creatures to flourish. "We're seeing animals here that we haven't seen before. Ones that have been missing for a long time," says Jim Hutslar, the reef's operations director and one of the founders. "We actually found a long spine sea urchin that was considered extinct in the Caribbean Sea." Sara Thanner, an environmental supervisor for the Department of Regulatory and Economic Resources, says an April survey showed the reef supports more than 65 different fish, shrimp and lobster and 75 other species including sponges, soft corals, and hard corals. For people making end-of-life plans, the reef means being part of something living. Hutslar is hoping that decades from now, the memorial will have grown into a massive coral reef where individual markers will no longer be distinguishable, and "family members will just know their loved ones are part of it." "We're creating life after life," he said. While Hutslar, Will and another diver descended to the ocean floor, Daniel and his wife and three children snorkeled on the surface, gazing down through the strong clear currents. They spotted a parrot fish, barracuda and a monster snook. Abundant schools of small, colorful fish darted in and out of the sculptures. They had picked out a small bronze headstone reading "Together at Last" to mark the ashes, adding their thumbprints on a decorative concrete sea shell. 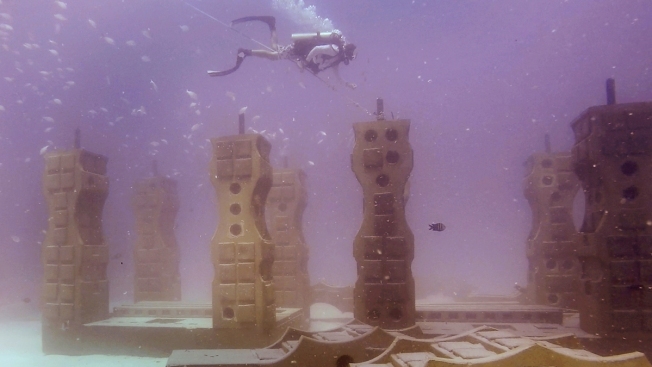 The divers picked a spot amid the underwater city's striking columns and statues. "It's just amazing. It's so peaceful," Will, 48, of Sachse, Texas, said after surfacing. "If there is a heaven, that would be it for them." Back on the boat, the family snacked on cookies and oranges and enjoyed a day at sea, laughing, hugging and crying at times. The men's aunt and uncle also brought red roses that each member of the family tossed overboard. Daniel, 41, of Princeton, Texas, said he plans to get scuba-certified so he can see it up close, and return every year. "I really didn't get it when (my mom) was telling me about it and the more and more I think about it, it's really a nice, peaceful spot for your last resting place," he said. Hutslar and his partners were solely focused on supporting marine life at first, figuring the cemetery would help pay for the reef. But he's helped hundreds of families say goodbye to their loved ones over the years, giving him a calling he's come to cherish. "This has actually become my favorite part — being with the families," said Hutslar. Memorials for children especially stick in his mind. There's something healing about the ocean. He says you can see it when families return to the surface. "You can watch something wash away," he said. It happened again, Hutslar said, as Will Payne paid his final respects. "I hope you're happy where you're at. I love you," Payne whispered through his mouthpiece. "Keep an eye on us."